8 Years ago the first version of the XNode Manager was posted to the code repository in an attempt to allow the editing of XNodes. Being a fan of XNodes, but knowing that the XNode Manager is pretty limiting because of its age, I set out to make a new version with similar functionality. The XNode Manager had a blank XNode, and blank Abilities that it just made copies of. This is fine but then the abilities and XNode are quite old. There were many new Abilities added since version 8.2 and you can't add them using the XNode Manager. 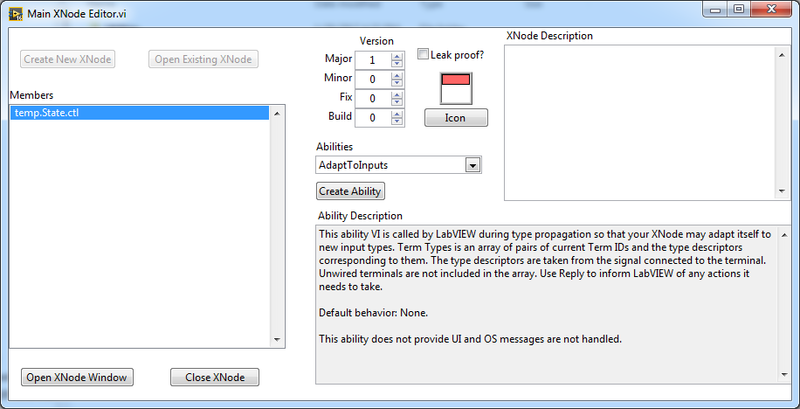 My XNode Editor reads your LabVIEW resource and populates the list of abilities to create from the ones that are possible to create. Then VI server is used to create the XNode, State control, and Abilities. This sets up the connector pane like it should and should work with all future versions of LabVIEW, until NI changes something that breaks it. 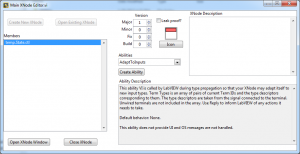 It also reads in the XNode Ability descriptions to help understand how to use the new ability VIs. In addition to being able to create and edit XNodes, you also can edit the XNode icon, and description, along with adding any new abilities. Be aware this uses several private functions, and several undocumented features that could be potentially bad. I did a decent test to make sure memory leaks weren't a problem and I made several XNodes and Abilities and it seems stable. But at the end of the day if it blows up and crashes, don't be surprised, you've been warned. The original thread with discussion and progress on this tool was started here. Updated to LabVIEW 2017, use the older version for 2012 through 2016. The ability to select file layout for new XNodes (and it uses the existing layout in existing XNodes when creating new abilities). A button to remove an ability. A button to open a new blank BD to play with. A button to put the XNode on the cursor. Symbols on the Members list that indicate when a member VI is broken. When your done editing the icon, it asks if you want to apply it to open items. 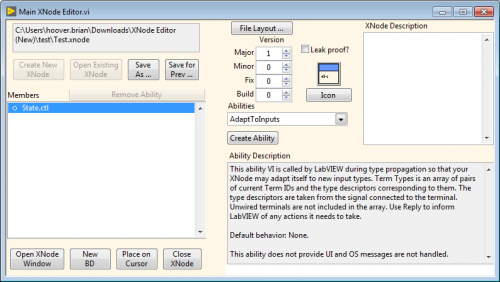 The file "Xnode Editor launcher.vi" which can be placed in ...\LabVIEW xxxx\project\ for easy access via the Tools menu. This is done with a static VI reference that may need to be updated depending on where the source is found. This was really just included as an example and in the future this likely should be handled by installing a package.